Industry Use: Power Generation – Fuel Systems. 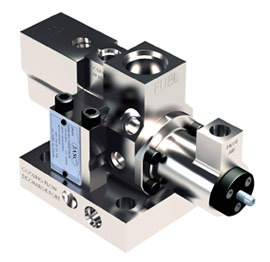 Water Cooled Liquid Fuel Check Valve is a state-of-the-art application and is a modified version of our Liquid Fuel Check Valve that incorporates active cooling of the check valves internals and no changes to fuel lines are necessary. 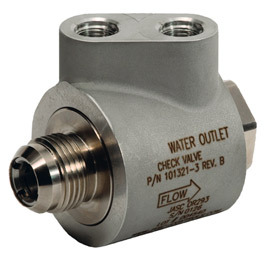 Water Cooled Liquid Fuel Check Valves ensures that a Class 6 seal is maintained in the check and reverse flow direction from hot gas path to hot gas path. The cooling medium of water helps to maintain an internal check valve temperature that is below the coking threshold of diesel fuel (approx. 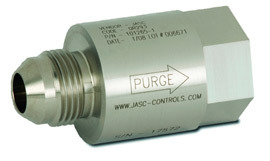 250 °F) while operating in an ambient environment in excess of 500 °F. 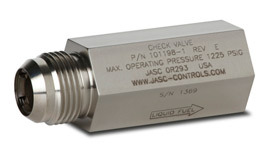 Successful laboratory tests have been conducted with water temperatures up to 150 °F, water pressure at 40 psig, and as little flow as 1/4 GPM flow rate, while still maintaining an internal check valve temperature below the coking threshold.